Deeper has hit the market with new and upgraded models. The sonar itself works better and the WIFI-feed is a noticeable improvement over the previous Bluetooth. But how does it all work out on or by the water? We take a deep dive into Deeper. Deeper lakeside north of the Arctic Circle in Norway. Deeper continues to be mentioned whenever a discussion on portable sonar is raised. So my teammate Lars and I asked Deeper if we could do a test, and shortly after received two Pro+ for testing. Deepers slogan is "Sonar for every fishing type", a rather ambitious statement. Is it true? After using Deeper a few months we believe we have the answer. Deeper Smart Sonar Pro+ is the top end model. It only weighs around 100 grams (3,5oz) and with a diameter of 6,5 centimeters (2,6 in) it is small and light enough to be casted out with a stiff fishingrod. Or perhaps we should say "heave" instead of "cast", since gracious casting is a bit difficult even with the lightweight Deeper? Deeper Smart Sonar Pro+ features a built-in GPS-receiver, enabling you to expand your search and mapping beyond the shore with the automated live-mapping in the Deeper-app. The WIFI-feed used to bring Deepers data to your smartphone or tablet is stated to have a range of 100 meters. Our testing showed this to be a bit optimistic, around 70 meters (230 ft.) seems more realistic. This is however enough, even more than enough with normal casting-gear. I expect that only guys with the most powerful surf-casting rods might wish for even longer range of the WIFI-signal. It is worth mentioning that I have previously tested one of the older Bluetooth-based models, and the WIFI-models are vastly improved both for range and dealing with signal-loss due to (small) waves. But even with the WIFI, it still takes little chop or waves to break the WIFI-feed. The WIFI operates at 2,4 gHz. 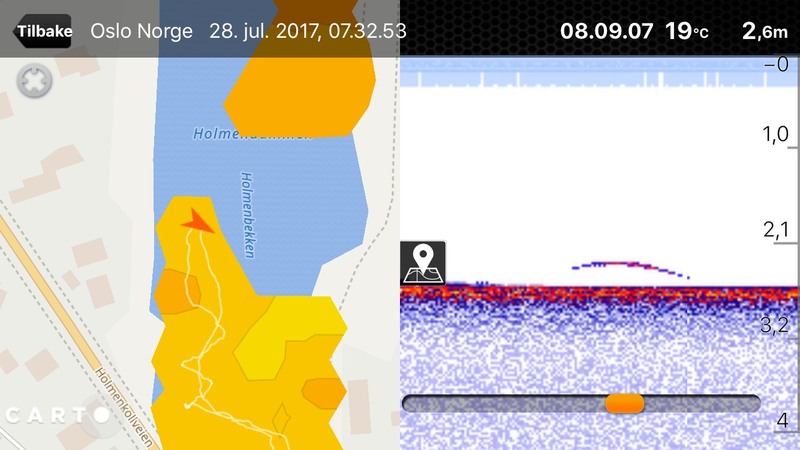 Deeper claims the internal GPS-receiver in Pro+ is "very accurate". Apart from that there is little information available on the GPS but when asked they informed me that it updates at 1Hz, which is slow compared to most modern chart plotters that are 5 to 10 times faster. As the more practical part of the test will show, the internal GPS does indeed have a few shortcomings. Deeper Smart Sonar Pro is very much like its brother Pro+, but lacks the internal GPS-receiver. Thus it cannot be used for making bathymetric charts from a distance, but can still do so when used in Boatmode with the GPS-receiver in a smartphone or tablet. All other specifications are identical. 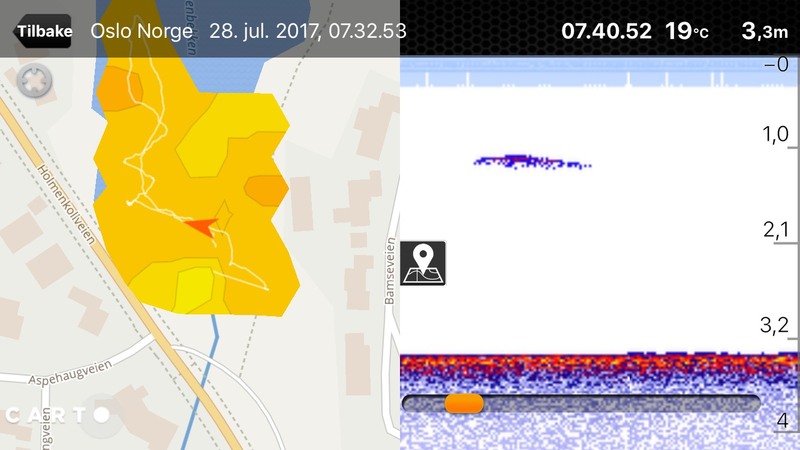 Deeper Smart Fishfinder 3.0 is the least expensive version, but is still slightly upgraded when compared to older models and can also do live-mapping when used in Boatmode. Perhaps the biggest difference between 3.0 and Pro/Pro+ is that it uses Bluetooth to connect with your smartphone/ tablet, rather than WIFI. Bluetooth has shorter range, about half of that with WIFI, and the feed cannot carry as much data/ information as WIFI. As for Pro, 3.0 lack the internal GPS-receiver as well. The sonar itself in 3.0 resembles the previous models more than Pro/Pro+. It has shorter range with a claimed maximum depth of 50 meters (160ft), as well as less target separation due to less resolution from the sonar. Fishing is indeed a dream come through for every gadget-fan, and Deeper has the extras needed. The original black top-cover can be changed to a clear see-through version called "Night Fishing cover", and thus a little LED-inside the Deeper will become visible when night fishing. With the SmartPhone Mount you can mount your smartphone to just about any fishingrod, and with the Winter SmartPhone Case you can prolong battery-life of your phone in cold conditions. Personally I had a lot of use for Deepers Flexible Arm Mount, making it easy to fasten Deeper to my two boats. Let`s talk more about the sonar. My first impression when opening the boxing was that this thing is small and light. Better with one in my hand then ten in the shop. I never found out what RMS and max wattage Deeper operates under. But in all honesty that is not all that important either. Today`s modern sonars give excellent results in relatively shallow water even when using a fraction of the wattage the old school 1000W-sonars did. It is all about pulse lengths and -modulation mixed with clever software, and not so much about raw power. Deeper is more about sophisticated software then hardware, so the fact that sonar-geeks like me have to ask in order to get info on what db. the coneangles are measured at, and at what Hz the GPS updates at, is quite ok. The transducer itself, and its piezo-ceramic element, is built into the lower part of the Deeper. It activates with a clever electric sensor that senses the Deeper is in water, and automatically starts pinging and running the WIFI-feed. Luckily there is an off-button as well, in the app you can manually shut the Deepers soundings off. This comes in as well though-out, especially if you like I live in a part of the world where it sometimes seems wetter on land then in the actual lake. It would be irritating to store the Deeper in a wet box, just to find out the battery is dead when you need it, but the off-button in the app takes care of that on those rainy days. As with most sonars sold as packages with a transducer in this pricerange, the transducer in Deeper consists of one ceramic element, which is manipulated by the sonars software to operate at two different frequencies and thus giving two different coneangles as well. 290 kHz is the highest of the two, and off course has the narrowest coneangle as well at 15 degrees measured at -3 db. 90 kHz has a coneangle of 55 degrees, quite wide, at the same db. The point being that the wider coneangle covers a larger area below the Deeper, while the narrower coneangle gives more detail. Theoretically speaking, 90 kHz will reach deeper than 290 kHz, as lower frequencies carry more power than higher frequencies and therefore has more reach in the water. But in real life this is very dependent on the coneangle as well. I found that 90 kHz only gave good results in very shallow water (less than 15 feet) and that generally speaking I got the all-round best results using 290 kHz at almost any depth. I`m guessing this is related to the wide coneangle of 90 kHz, giving a lot more signal loss then 290 kHz as the echoes are reflected out on many different directions, and thus not returning to the Deeper at such power that the Deeper can pick up on them. 15 degrees coneangle is at any measurement wide enough to see if there is baitfish in the area if you move the Deeper around a little, and give by far the most detailed bottom-line. When using the livemapping, I would recommend 290 kHz over 90 kHz any day, as the narrow coneangle gives far more precise depths then a wider coneangle. Let`s look at the app. Since Deeper does not come with a designated screen, you need a smartphone or tablet to use it. This is both a weakness and a strength, but helps to keep the price of the unit down. 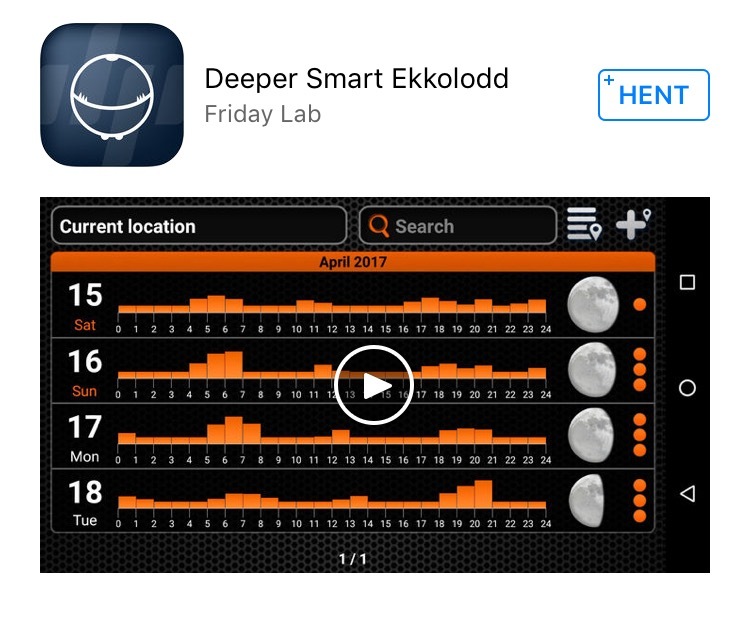 In order to use your smartphone or tablet with Deeper, you must first download the (free) Deeper app, and it`s available both for IOS (Apple) and Android (Samsung, Sony etc). The app also works offline, so you do not have to have an active SIM-card with mobile-data on in your mobile device. But some features (like the map, uploading to Lakebook and weather forecast) needs mobile-data to work, and keep in mind that some mobile devices without SIM-card ("WIFI-only") does not have an internal GPS-receiver and thus will not work with live-mapping in Deepers Boatmode. Camera, for taking pics that you can add to the notebook. Notebook, sorted with dates from your trips. Sonar- and track history, you can review your past trips. 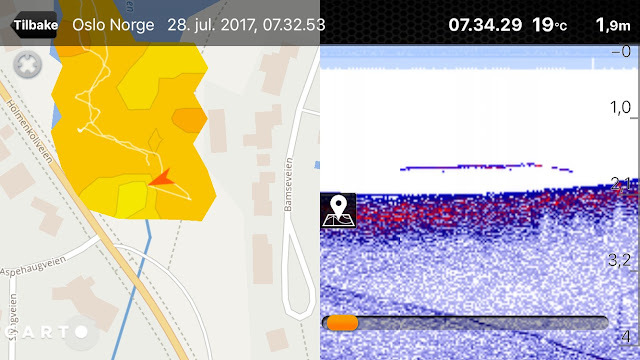 The only two things I personally miss in the app: The opportunity to view the sonar and map with my mobile device "the right way", i.e. upright instead of sideways, and the opportunity to connect more than one mobile device to one Deeper. The app itself is very stable on newish mobile devices like my IPhone 6, but somewhat sluggish and sometimes needs restarting on my old 1. generation IPad Mini. I admit it, I`m a geek when it comes to marine electronics. Lakebook is a cloud-based service, cloud-based means your data is stored on a server somewhere and you can access it pretty much anywhere you go, on your PC/ Mac or your mobile device. The export-functionality in Lakebook is a great tool for any geek, and enables you to use GIS-data (depth and position) from your Deeper in other applications like Reefmaster. Lakebook allows you to sit comfortably at home and look at your Deeper-maps on a large screen, using Carto-maps or satellite-imagery as background. I was impressed by Lakebook so I asked Deeper if they had any future plans for Lakebook, especially when it comes to sharing data, as this would seem like a natural step two and thus giving Insight Genesis (Lowrance/ Simrad) and Connect (Garmin) some competition. They replied that they are indeed looking into sharing, but that they also have other features for Lakebook that they are working on and could not reveal exactly what. I`ll be looking forward to more news from Deeper on this, but I would not hold my breath as it took the two largest brands in the marine electronic industry several years to get their versions online. Community based mapping is a great tool, but for the techs making it all happen there is a lot to cover. Out on the water - let the games begin. Enough of the theory and features, let`s get out on the water and see some action. 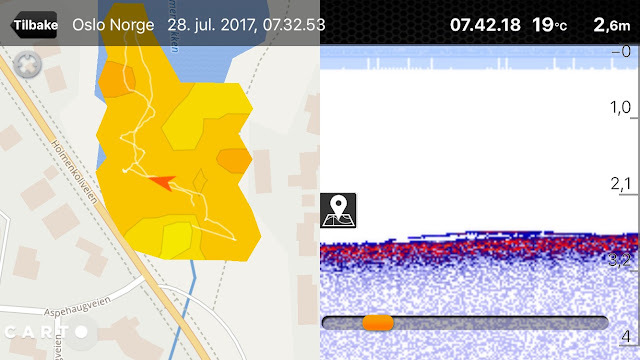 My first experience with Deeper was in my larger boat, and I quickly found that the 1Hz update-speed of the internal GPS-receiver in Deeper was not found of boats on plane, it could simply not keep up. This is however not a practical problem, as Deeper is not meant to be used while on plane either. It is very comfortable when trolling in 2-3 knots, both sonar and GPS is sufficient up to those speeds, and when used in a boat the setting "Boatmode" is your go-to setting anyway and that uses the GPS-receiver in your mobile device. So the slow update-speed of the internal GPS-receiver is not a practical problem. As mentioned above, Deeper is easy to use and the app works well. The WIFI-feed has a code that tells your phone or tablet that the feed does not connect to Internet, so you can stay connected to the WIFI and still use other applications with mobile data. There are a lot of other products out there that should learn from Deeper here, having to connect and disconnect from WIFI just to switch between applications is unnecessary. With Deeper it is easy to switch from Deeper, to Facebook, Twitter or whatever, and back again. So you can keep on annoying all your friends with those photos of dream-catches while staying connected to the Deeper. Using an 850 mAh battery with a stated run-time of 5,5 hours, the average power consumption for Deeper is 155 mAh (0,16 Ah). That is longer run-time then my IPad Mini and IPhone 6 combined, and a powerbank or other source for charging my tablet/ phone is a must on most trips using Deeper. In comparison, most regular sonar models run at 5-8 times more power, which off course includes powering the sonars screen. Screen backlight is a large source of power consumption for regular sonar models, but the powerconsumption of Deeper is still very low. Those low numbers must off course reflect on the sonars power. Deeper does not use chirp-technology for its sonar, but uses a regular fixed frequency of 90 or 290 kHz. In shallow water, down to 30 feet or so, Deeper delivers a good image of bottom-structure and composition, especially in 290 kHz. With 90 kHz the sonar quickly loses the ability to give good information of the bottom as depth increases and it becomes impossible to determine bottom-composition (hard/ soft bottom). This is by no means surprising, and is connected to the very wide coneangle at 90 kHz. Switching from 90 to 290 kHz. Fishing from 30 feet and into shallow water, the Deeper does a good job. It shows fish just as well as my other sonars. Here is a series of screenshots from a local small lake. All screenshots are taken using 290 kHz, and depth is in meters. (1 meter = 3 feet). Passing over a single fish. Staying on top of a single fish. Here is a fish high up in the water column. As the screenshots above shows, Deeper works well in shallow water. My testing shows that Deeper reveals fish well down to 30-45 feet but going even deeper the ability to show fish quickly demolishes. The bottom line can be read down to the advertised 260 feet or so (in freshwater) but trying to find fish beyond 45 feet is a bit optimistic. The screenshot below is about as deep as I get good readings of fish from Deeper, in 39 feet of freshwater. Baitfish from bottom at 39 feet and up to 30 feet. 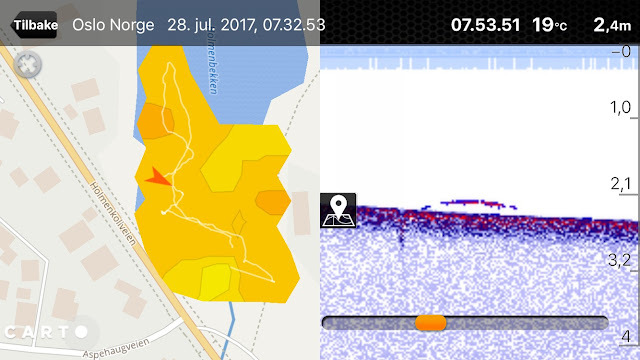 Here is a screenshot for comparison, from a Lowrance Elite Ti using the TotalScan-transducer at the same time and place. 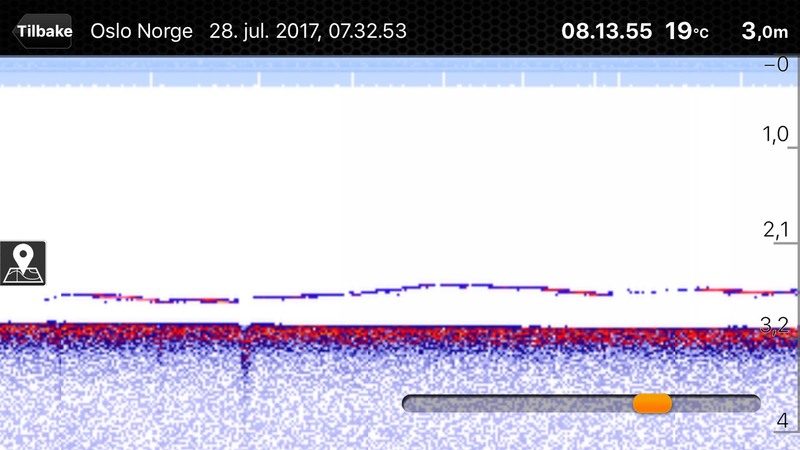 Note the upwards going returns showing rising gas bubbles, these returns where too weak for Deeper to notice but are shown on the Lowrance. Comparing Deeper with traditional (and in the example above; more expensive) sonar is a bit like comparing apples to oranges. But when testing different models of sonar, comparing images from the same time and place is still important. If nothing else, it shows the limitations, and thus I have spent a lot of time running Deeper "side-by-side" with other brands. The conclusion is the same as above, down to 30-45 feet Deeper works well as a fishfinder. From shore - does it work? Looking at how Deeper is marketed and used, its main applications are when fishing from small vessels and from shore, and this is also where I was most eager to test it. My second trip with the Deeper was down at my local marina (saltwater) and in order to cast the Deeper I brought my rather heavy pike rod. Best of friends - Deeper and a stiff casting rod. As to be expected, the sonar works just like in Boatmode. No suprises there. 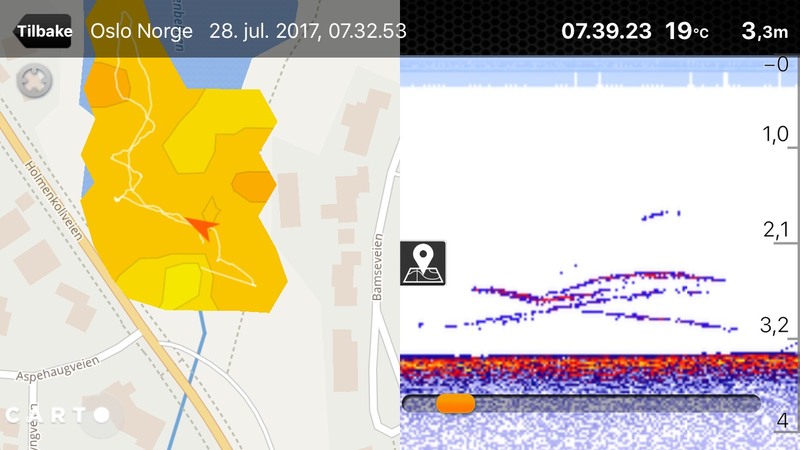 But since I had the model with an internal GPS-receiver on test, Deeper Smart Sonar Pro+, I was eager to test its mapping-capabilities in shorefishing-mode. Since you get both depth (from the sonar) and position (from the GPS) the live-mapping can be done also when fishing from the shore with the Pro+. One thing to keep in mind when using deeper from the shore, is that patience is the key. First of all, it is important that the Deeper has sufficient GPS-lock, or you will end up with a map where the depths are correct but placed in the wrong spots. I.e. useless. Off course Deeper has thought of that, and the live-mapping does not kick in before the Deeper believes it has enough triangulation from the GPS-satellites to properly place it. The second factor is the movement of the Deeper. If you reel in to fast, the Deeper tilts slightly, or gets water splashing over it. In the first case the signal will not go straight down to bottom, leaving you with a sonar showing wrong depths (too deep). In the second case the WIFI-feed to your smartphone/ tablet is broken, and you lose the connection. You quickly get into a rhythm of casting-waiting for GPS-lock and a stable Deeper, slow reeling a turn or two, wait for the Deeper to stabilize, slow reeling a turn or two etc etc. In the real world this also requires a more or less flat sea, waves quickly make (accurate) mapping from the shore impossible. A gust or two of wind is no problem, but even small 3 inch waves impacts the Deeper. Patience, or a broken bottom-line will tell you that the Deeper is not stabile enough. Correct depth, but in the wrong place. So what is going on there? The Deeper believes it has GPS-lock, so it starts to render the contours and records the data, but off course it did not have good enough triangulation to be correct. This was worrying, so I borrowed another Pro+ for myself, and sent two other techy-fishermen out with the Deepers to do their own testing. End result: both Deepers and all three testers showed the same. Correct depths, and mostly correct positioning, but sometimes the positioning went bananas making the contour-map useless and incorrect. It is worth mentioning that this ONLY happens when using the Deeper in Shore-mode, in Boat-mode this is NOT a problem. Deeper in Boat-mode, smartphone and RC-boat. 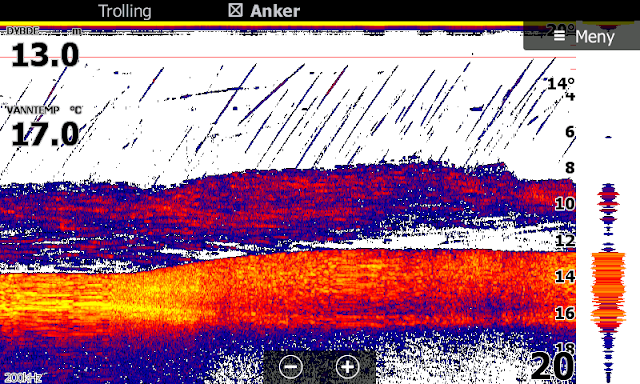 From my point of view, Deeper Smart Sonar Pro is probably the best product in its class, i.e. castable sonar. The closes competition would be Vexilars SonarPhone T-pod, which is based on much the same principle as Deeper. But SonarPhone is a step or two behind, relying on Bluetooth instead of WIFI, and with less sophisticated sonar and without the internal GPS-receiver. We could mention Raymarines Wi-Fish, but that only has scanning sonar (not traditional 2D-sonar) and cannot be used from the shore. This leads us to what I see as Deepers main competition as per now, sonar for mounting on a boat but made portable. All the main brands have ready to go solutions, or you can make your own. Off course you need some sort of floating vessel to use your portable sonar, it cannot be used from shore. It will also take up more space, and have a total weight far away from the light and nimble Deeper. But on the other hand you can pretty much decide for yourself how long you want the battery to last (by choosing a battery size that fits your needs) and you get better sonar at deeper water then with Deeper. What do we like about Deeper? Deeper is easy to use, extremely mobile, lightweight, small and relatively cheap. It seems obvious that the people behind Deeper takes the time and money to continue to improve their product, and the services built around it like Lakebook. Through chatting and emailing with the Deeper-crew, we get the impression that they are looking forward, they are service-friendly and very open for suggestions from their users. Continuous improvement of existing software is a good thing, so we believe we still have more good and exiting stuff to look forward to from Deeper. Deeper at its best - in boat-mode. What is there to dislike about Deeper? Deeper has specialized their product, really pin-pointing its strong points. That sort of dedication also has a negative side, things that fall outside of the parameter Deeper sees as their niche. If you like the concept (which I do), those shortcomings are easily overlooked or worked around. To answer my initial question, is Deepers slogan "Sonars for every fishing type" true? Well, no it is not. It is not even close, but I did not expect it to be either. At the same price point you get better sonar for mounting in your boat/ skiff/ kayak/ whatever, and Deepers Achilles` heels are deep water and less than stellar internal GPS-receiver on Pro+. Deeper is small and light, the flip-side to that is a simple transducer and short battery-life. Deeper is relatively inexpensive, again the flip-side is a simple transducer. Deeper needs your smartphone or tablet to give meaning, again the flip-side is whatever limitations your smartphone/ tables has when it comes to readability in sunshine, waterproofing, battery run-time or how much you can dim the screen when fishing in the dark. Technically, the only dislike I have is the internal GPS-receiver on Pro+, the rest works like expected or better. Personally, I will be the first one to que up once the Pro+ comes with a better GPS-receiver, but until then I`m keeping my current one for those occasions where it fits my needs. That kind of says it all?